The Weekly Dump 10.14.16 – Santa Mierda! This week’s coverage includes more on the pipe bomb scare that shut down Pacific Avenue, elderly woman mugged by gang near Arana Gulch, guns drawn in Harvey West park, guns found in Blue Ball park, shooting in the Beach Flats, Riverside park is a nice place to shoot up and brawl, 17 Express bus burns on 17, Keeping Up With Chris Krohn, Mike Rotkin hates the brand new council, deep thoughts from DeNiro, local measures on the ballot (with recommendations), city council candidate endorsements, weekly shoutouts, and probably a few more things too! Wednesday morning a pipe bomb was reported to be attached to the side of the Metro Center building in downtown Santa Cruz. 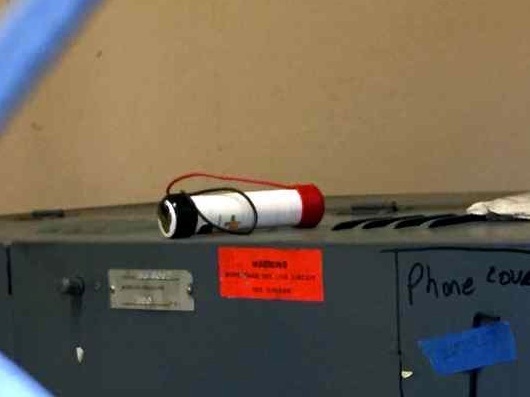 The supposed bomb was found taped to the side of an electrical box on the side facing Pacific Avenue. Streets were closed and traffic was rerouted. Businesses and residents on Pacific Avenue had to be evacuated. After a couple of very nervous hours, the scene was reported to be cleared. Apparently the “bomb” was some kind of home made battery (which did actually look like a pipe bomb) that was left by a contractor doing work at the Metro Center. Just another crazy Wednesday morning in Downtown Santa Cruz. Read more about this story here. Blame the idiot contractors for scaring the mierda out of everyone. An elderly woman walking near her assisted living facility was mugged by a gang of young men this past week. She’s a senior living in assisted living housing and was mugged by a local gang in the parking lot of La Posada apartments. 3-6 young males, who were last seen fleeing the scene into the Arana Gulch area. All of this information came from witnesses, family members, and friends and neighbors of those effected. I’ve heard nothing from SCPD, nothing from the mainstream media here. I wonder why. Let me guess. It’s either not a good look or it happens so frequently it’s just not “newsworthy”. I think it’s newsworthy. I’ve heard this poor woman wasn’t seriously hurt, just shaken up. I’m sure she’s quite shaken up. I wish I had more to report on this but all I’ve heard so far is silence. I heard a call come in Sunday morning that someone was being stopped at gunpoint beside the bathrooms next to the baseball field at Harvey West park. Multiple CHP and SCPD units, guns drawn. 9 o’clock on a Sunday morning. Kids should be safely playing ball at that time. Instead, we have the usual morning vagrancy in and around Harvey West park. In another item I’m sure you won’t read about in the mainstream media, a child reportedly found a gun behind the playground in Anna Jean Cummings Park (also known as “Blue Ball” park). This 95 acre park in Soquel is a pretty popular park, with a children’s playground, extensive hiking trails, and is popular and often crowded with families. I heard from multiple people that Friday a child found a gun in the bushes behind the playground. Apparently the sheriff’s office came and picked up the gun. In a real shooting, Sunday night around 5pm, there was a fight at the 7/11 at 367 Ocean which escalated into one of the guys shooting a gun (in the air? bad shot?) which then really escalated into a full blown police chase down Ocean near Barson, with the fleeing Nissan blowing through multiple stop signs. The vehicle finally crashed at Barson and Campbell. 3 people were ultimately arrested on a variety of felony and misdemeanor charges. I really feel for the folks living in the Beach Flats area (not named Posner or Krohn). It’s home to some of our most struggling residents. The housing stock in the area is known for code enforcement violations (just ask the Krohns!). And they seem to constantly battle criminal nuisance activity as a result of our over “progressive”, over tolerant attitude. They battled a makeshift mobile needle handout for years until the community forced the city to outlaw it. Some transient bum, described by SCPD as “5150”, decided it might be funny to walk along Pacific Avenue in front of Starbucks on Sunday morning and pretend to shoot people walking along Pacific Avenue. “5150” can mean anything here. It’s far from a clinical definition locally. SCPD picked him up near Verve and Jamba Juice. In just about any other town this clown gets pummeled not coddled. We love our bums here. I looked the guy up. He was also arrested on October 1st and October 7th. The only thing we love more than our local bums are the local recidivist bums. If SCPD knows you by name, you own the title. Sunday morning around 9:30 a call came in that 2 people were shooting up either heroin or meth in Riverside Garden Park, off of Riverside in the Beach Flats area. Remember Riverside Garden Park? That “vibrant” community garden the city set up in the lower Ocean neighborhood? It’s a vibrant shooting gallery on Sunday mornings now. And you wonder why people keep finding needles in the parks? Here’s why! Reports came in that one person was selling the other the drugs, and the buyer was just openly shooting up in the park (the caller said that needles were visible and the user was actually shooting up in the park). As the RP waited for PD to show up, a 3rd male showed up, shirtless, with multiple bikes in tow. Hey, does this sound familiar? It should! It happens daily! SCPD did show up and caught all 3 and ran their names. One guy had apparently been caught a few hours earlier for something else as dispatch said they just ran his information that morning. Sound familiar? One guy was wanted out of Oregon for drugs but they won’t extradite. Sound familiar? At least 2 guys got multiple probation violation hits here. Probation. What the hell good is it when we deal with knobs like these guys OVER AND OVER EVERY FREAKING DAY? Probation is how the county justifies ignoring the public safety issue. Sunday afternoon I got word of a fight on Riverside and San Lorenzo between 2 “heavy set Hispanic women” and a black male described as “no shirt, wearing his underwear, pants down around his ankles”. Same park as above. What are they growing in this park? Poppies? PD was there within minutes but couldn’t find the exact location of the incident so no arrests were made. Monday morning a 17 Express Metro bus caught fire near Los Gatos on the way to bring commuters and other folks to San Jose from Santa Cruz. Apparently it was a pretty scary scene, but the driver managed to pull over safely and get everyone off the bus without harm. The bus itself was pretty much a total loss, according to someone who saw it after it was towed back to the bus yard in Santa Cruz. All kinds of unpleasantness could have developed here but thanks to some quick action by the driver (and a quick response from fire), it was mostly just a temporary mess. It made a mess of traffic that morning. But had this happened higher up the hill, or in an area denser with vegetation, it could have been a nightmare. Just a heads up about this. I’ve heard very little about it. The “East of the River Santa Cruz City Council Candidate Forum”. It’s happening tonight at the Santa Cruz Community Church on Roxas Street, in the East Morrissey Neighborhood. It’s hosted by the Branciforte Business Association and “Branciforte Action Committee” (whatever that is). It’s taking place from 5-7PM. This might be your last chance to hear everyone in a group setting before the election, so if you haven’t caught any of the previous forums, this might be your last chance. “Keeping Up With Chris Krohn” explores the colorful past and history of Chris Krohn, former mayor and now a city council candidate after being out of government for the past 16 years. Chris Krohn is back in the news this week! City code enforcement documents show that he and his wife have dealt with numerous violations (no permit) on modifications to a rental property in the city on and off for AT LEAST 10 YEARS. The most recent complaint came against the couple’s double garage adjacent to a rental home they own on Barson St. in the Lower Ocean neighborhood. The complaint was finally cleared after the Krohn’s removed a full bathroom and heating unit that had been installed without proper permitting. While the garage’s extra room came with the property, both Krohn and his wife declined to specify when a full bathroom and heating unit, both designated as unpermitted additions by the city, were added to the property. This issue dates back 10 years. Krohn claims nobody has lived in the unit “for a long time”. Like we’re supposed to just believe this fool? Isn’t slumlord Micah Posner behind his campaign? Birds of a feather flock together. So (like Micah) he basically isn’t being honest, transparent, or forthcoming here. Is that what you want from your city council? Read the full article in the Senile here. Of course it’s not a big issue for Chris Krohn. He’s got an empty rental property and he whines about affordable housing. That’s called “do as I say not as I do”. It’s been YEARS since anyone lived there. They use it for storage. Not for “affordable housing”. For storing someone else’s mierda. What a HYPOCRITE. He likes to talk the talk but he sure as hell doesn’t walk the walk. If you see Chris or his wife, ask them if they support the redevelopment of the Jessie Street Apartments? The low income, “affordable housing” units next door to his house (and the swamp) are for low income disabled and mentally ill people. Management and developers want to expand, upgrade and improve the project. Chris and his wife have reportedly fought them for years on this. I’ve heard Chris and his wife threw up every road block they could come up with (reports to code enforcement, litigation threats) just to protect their precious swamp next door. Long time progressive and arguably Santa Cruz’s most famous reformed socialist Mike Rotkin had a stinging rebuke of the “Self Appointed Progressives Misappropriating Bernie Sanders Name & Mailing List” slate (otherwise known as the “Brand New Council”) in a recent editorial in the Sentinel. He’s spot on. He calls them the “Sanders Caucus”. Mike Rotkin is a former five-time mayor of Santa Cruz and was active in the Bernie Sanders campaign. He’s just one of many, many local Democrats and Bernie Sanders supporters (like myself) who is pretty disgusted by these clowns and their attempt to run on the back of Sanders and his supporters. All these people are doing is alienating more Sanders supporters than they are influencing here. Just ignore the “Brand New Clowncil”. They’re clowning you here. I did not attend this weeks Council meeting, I watched from home. Things seemed relatively quiet and mellow. One issue I found interesting in the consent agenda was a resolution approving the application for grant funds for the widening of the railroad trestle or “Lost Boys” bridge. At some point during the consent agenda, our friend in the bathrobe chimed in on a topic he admittedly wasn’t clear on but decided to comment anyway. There was a really great presentation on Tiny Houses. I was really impressed with the work staff put into this. I think it’s time. Of course Santa Cruz doesn’t have a lot of space but clearly something needs to be done. As far as public comments on this topic; One weird guy said that the city had lack of vision in planning. Something tells me this guy wouldn’t know a good plan if it came up and kicked him in the nuts. He mentioned that Portland had excellent tiny house communities. How about you move there? Then the resident anti-Semite had to come in and say that we really shouldn’t be focusing on tiny houses, people should just stop breeding. Robe guy complained that staff was given a half an hour to give a presentation and public comments were limited to two minutes each. 21st century policing task force recommendations was also on the agenda. Rick Martinez made a brief presentation. This is about building trust with police and the community and the police welcome the conversation. Many of these policies are already being followed by Santa Cruz PD. This also would involve deployment of body cameras. The person I mentioned earlier who should move to Portland says he has made countless calls to Santa Cruz police and the FBI with gang tips. He then said something about getting 5150’d. At Oral Communications, Anti-Semite guy blathered on about his usual conspiracy theory crap. I don’t remember anything else. What’s a Santa Cruz City Council race without an “anarchist” candidate? This year we have none other than anti-police, anti-Public Safety Task Force report, pro-Sanctuary Camp candidate Steve Schnaar. His anti-law enforcement activities and involvement in Occupy Santa Cruz are examples of his “anarchist tendencies”. Despite Santa Cruz having one of the highest crime rates in the nation, and the Santa Cruz Police Department receiving hundreds of thousands of calls (far more calls for service per officer than any other comparable jurisdiction), Schnaar claims that SCPD is not understaffed, and argued against the Public Safety Task Force’s recommendations that SCPD increase its ranks. Schnaar, a bike mechanic who works next to Sub Rosa (our local Anarchist café), went so far as to block entry by police to the bank where squatters caused thousands of dollars of damage during the “Occupy Santa Cruz” debacle. Here he is, on the far right of this video screen capture, standing with arms locked preventing SCPD from entering the building. Mr. Schnaar wrote in a previously published letter entitled ‘The Case For Violence’, that “Consistent, politically motivated property destruction has been one of the single most effective tools of the environmental movement.” He argues that violent resistance is a legitimate avenue for social change because “none of us knows all the answers to the world’s problems, so we should support people at any level.” While he more recently attempted to disavow violence in a Good Times article where he is discussing local Anarchists after the May Day Riot of 2010, his previous argument in favor of property destruction is disconcerting to say the least. Voting for Schnaar is the equivalent of voting for an anarchist. Cities are first and foremost tasked with public safety, including properly staffing and supporting our police force. The embracing of anarchy – defined as “absence of government” – flies in the face of the role of a City Council Member. Santa Cruz deserves better. Robert DeNiro would like to punch Donald Trump in the face. If you haven’t already voted by absentee ballot, you can still bring it to your local polling place on November 8th and just drop it off. So you can fill it out in advance and just drop it off the day of the election (which is what I usually do). But don’t forget to vote! This city council election is very important for the future of Santa Cruz for at least the next 4 years. Past elections have been won or lost by as little as a few hundred votes, so every vote really does matter here. People have died for our right to vote. The least we can do is respect them by doing it. To upgrade local middle and high school classrooms, science labs, career training facilities, and technology infrastructure to support student achievement in math, science, engineering, English, social studies, visual/performing arts, technology, and skilled trades; acquire, renovate, construct/equip classrooms, sites/facilities; and improve school safety, security and disabled access; shall Santa Cruz City High School District issue $140 million in bonds at legal interest rates, with independent citizen oversight, annual audits, and all funds benefitting local middle and high schools. Why: We need to invest in our kids and their education more than we need to invest in more social service programs. This is infrastructure improvement which is more important than expanding social service programs locally. We need smarter kids. This helps kids achieve their potential. To repair/upgrade neighborhood elementary school classrooms and facilities, including deteriorated roofs, plumbing, and electrical systems; remove hazardous materials; renovate, construct/equip, acquire classrooms, facilities and technology infrastructure to support programs in reading, math, science, arts and technology; improve school safety/security; and replace outdated portables with modern classrooms; shall Santa Cruz City Elementary School District issue $68 million in bonds at legal interest rates, with independent citizen oversight, annual audits and all funds dedicated locally to Santa Cruz elementary schools? To improve the quality of education with funding that cannot be taken by the State; repair/replace leaky roofs; make health, safety and security improvements; replace deteriorating plumbing and sewer systems; improve student access to computers and modern technology; modernize/construct classrooms, restrooms and school facilities; and upgrade inadequate electrical systems; shall Soquel Union Elementary School District issue $42 million in bonds at legal interest rates, have an independent citizens’ oversight committee, and have NO money used for administrative salaries? In order to: improve children’s safety around schools; repair potholes; repave streets; improve traffic flow on Highway 1; maintain senior/disabled transit; reduce global warming pollution by providing transportation options like sidewalks, buses, bike lanes, trails; preserve rail options; shall Santa Cruz County voters adopt an ordinance establishing a half-cent sales tax for 30 years, raising approximately $17 million annually, requiring citizen oversight, independent audits, and funds spent locally? Why: We need wider roads along the Highway 1 south corridor. Amendment of the Cannabis Business Tax Ordinance. To protect the quality of life in Santa Cruz County and to fund essential County services such as police, fire, emergency response, health services, youth and senior programs, job creation, housing, environmental protection, and animal shelter/adoption, shall Measure K be amended to revise the definition of cannabis to conform to State law and revise the definition of cannabis business or medical marijuana business to include all cannabis businesses with all funds staying local? Why: Might as well tax it and use the funds as directed above. We tax other vices. If approved by a majority of voters, this proposed Charter amendment would amend Section 604 to specify that, in election years, the Mayor and Vice-Mayor shall be elected by the City Council at the first regularly or specially scheduled evening Council following the County election official’s certification of the general municipal election results. This proposed amendment to Section 1429 would retain language protecting the inalienability of the City’s water system, but would delete the reference to “rent or income,” to clarify the City’s ability to take advantage of available grant funding and favorable debt financing terms, by pledging revenue from the water system for matching funds for grant awards and issue debt for capital facilities. This ballot measure has been placed on the ballot by the Santa Cruz City Council. It requires a simple majority to pass. Amendment of the Cannabis Business Tax Ordinance. To protect the quality of life in the City of Santa Cruz and to fund essential city services such as police, fire, emergency response, youth and senior programs, job creation, housing, and environmental protection, shall Measure L be amended to clarify minor administrative procedures, revise the cannabis definition to conform to State law and revise the definition of cannabis business or medical marijuana business to include all cannabis businesses with all funds staying local? CITY COUNCIL CANDIDATES ENDORSED BY THE WEEKLY DUMP! I’m endorsing her for a number of reasons. She has a masters degree in public policy so she’s not just someone with a bunch of grand ideas with no substance and no ability to make it happen. She seems pragmatic. She works for the County Office of Education so she’s already doing public service work that really does benefit not only the community but the less fortunate as well. I realize she’s not actively selling “public safety” as part of her campaign, and that’s a concern for me. But I think she understands what needs to be done there without the need to spell it out yet. I really like what I saw at the first candidate forum. I think she was the best speaker. She didn’t read from a script but seemed to be very well prepared. She’s raising 2 young kids. I’m sure she can handle the kindergarten atmosphere of most city council meetings like the adult in the room. I have little doubt that she’d do a fine job on the city council. I might not agree with all of her positions, and I’m fine with that. I’m not always right. Just most of the time. I’m endorsing him for a number of reasons. He’s smart, ambitious, and idealistic. And perhaps more importantly he’s fresh. He’s not a retread. He’s also not afraid to tackle sensitive subjects and try to identify better solutions. He’s not married to an ideology. He seems both progressive and pragmatic. I think he understands the challenges of improving public safety in Santa Cruz, a town easily frightened by a rescue vehicle named after a cute little animal. One thing I feel he does understand is the red-line level of dysfunction within the city government. I don’t think he can fix it (at least not by himself) but I don’t think he’ll perpetuate it either. I think he’s a break from the status quo, despite being endorsed by the status quo. He serves on the Downtown Commission, so I’m sure he’d represent their interests better than some of the others on the city council do or will. And perhaps his biggest strength is he’s smart enough to understand the nuances of data driven analytics and how to apply that to improving the way our city government “does business”, especially with social service based non-profits looking for handouts in perpetuity. I know I’ve been pretty hard on her here at the Dump, and it’s really not personal. She’s the Mayor. She means well. I never doubt that. It’s kind of a reflection right now of her job performance. But the truth is I blame City Manager Martin Bernal MUCH more for the local public safety issues than Cynthia or any other person on the city council. If anything, I’ve been disappointed that she didn’t do more this year as Mayor, but she hasn’t done a bad job, and given the fact that she has to deal with both Don AND Micah pontificating and basically derailing every single meeting, and the local circus from the public, and the fact that she’s still doing it and seems to enjoy doing it! Now that’s hard to find. What she does bring is obvious wisdom, knowledge of history, and perspective. She is status quo, and I know I complain A LOT about that. But we should be careful to not toss the baby (Cynthia) out with the bathwater (Don and Micah). You can have a variety of opinion about Cynthia but she is definitely pragmatic, and that’s pretty high on my checklist. Yes she panders. It’s an election! They all do. Some more than others. But she has shown an ability to actually deliver. At least when she doesn’t have a circus to deal with. Hopefully the next city council will be less circus and less circuitous. The new members can learn a lot from her experience in navigating city government. Weekly shoutout to Ranger Don and guy on the bike named Ron for helping Big Mac get Bianca back! Shoutout to my buddy Ron who I ran into at Whole Foods this week, and who quietly cleans up most of the crap the city doesn’t want you to see or know about it (they contract it out to him). He’s like Winston Wolfe from Pulp Fiction. He solves problems. He’s the city’s “cleaner”. Ron is about as old school Santa Cruz as they come (and he loves the Dump), so it’s always great to klatch and get his perspective on everything. I’m only familiar with his wife from seeing her shrill on at city council meetings. And she seems to be part of the group wanting a permanent homeless camp locally. I think Steve does some good community service work locally, like the Fruit Tree Project, but I just don’t think he’s right for the city council. Partly for the concerns you mentioned and partly because I think his history in engaging with SCPD is not good (he fought with SCPD over the bike donation program and it got pretty ugly), and we need someone who can create better synergy between SCPD and the city council. Right now I think that relationship is tenuous and fractured, and I just don’t think Steve can do anything to fix that. He’d just exacerbate the problem. Thanks for reading and commenting! Stab Santa Cruz no more! Another possible landmark event may be of interest to readers familiar with “Stab Santa Cruz”. Apparently, this month marked the end of Stab Santa Cruz, and not for lack of stabbings. What little I know: I guess someone back a few years ago decided they would simply maintain a count of how many people were stabbed in Santa Cruz. So a running count of stabbings was maintained and updated, and one could follow the stabbing trends. I am guessing that it was believed that the local media was not exactly dedicated to reporting these incidents. I finally become aware of its existence a year or two ago. Soon afterward, believe it or not, there was a stabbing just down the street from me, and low and behold, nary a word of it in the local media. I thought, I would notify Stab of the stabbing. But at that time I was unable to find contact information. I’m not saying that the web page was being pressured to back off of stab reporting. But clearly, the drive to present the truth was no longer a priority. I was saddened by the feeling that a dose of reality for Santa Cruz was being abandoned. That even maintaining one simple statistic, the number of people stabbed in Santa Cruz, was to much honesty for a city in denial. By chance I stumbled on to the Facebook page. October 6th was the final entry. The creator of the former web page, then Facebook page has moved home and business to Watsonville and said since he is no longer in Santa Cruz he would end the Stab Santa Cruz tradition. I probably shouldn’t speculate, but I doubt it would even be possible to post reliable statistics. Sound cynical? Don’t forget: I was unable to even report my unreported stabbing. Who can even guess how many more stabbings went that route. If anyone is curious it was not on the police log because paramedics responded, and it simply was not picked up by anyone. I only knew because some neighbors saw the paramedic truck and investigated. For the rest of Santa Cruz it was a happy, happy, fun, fun summer day in Santa Cruz. Sorry I can’t be more specific. This is Santa Cruz, you know! I know who Bathrobe guy is (I remember when he first blew into town, couldn’t believe he got any traction). You have mentioned Anti-Semite guy a few times, I have no idea who that is. Can you give me a little background on him? I asked Hugh about this (since it was Hugh who called him that) and he told me the guy’s name but I don’t want to publish his real name here. Let’s just call him Pat and leave it at that. He shows up at almost every city council meeting to preach his hate for Israel. Lol No problem, I was just wondering what his story was. I tend to avoid the downtown area these days but if he was say— standing naked in an overflowing bubblebath in the town clock fountain screaming through a bullhorn while onlookers were throwing rotten fruit at him, for example, I might just go downtown to see that show! He’s actually very “normal” looking. It’s what comes out of his mouth that isn’t normal. If you watch oral communications at any city council meeting (live or on community tv), he’s almost always there for his 2 minute hate speech. He knows he’s on TV. It’s why he does it. He’s not worth anyone’s time simply because he offers nothing constructive of value. He’s the poster boy for Godwin’s Law.